The primary reason...they have the potential to save thousands of lives…including yours! You can trust our EMS professionals for the most accurate, objective information and friendly assistance available. The five key features of all AEDs. A review of the the options that will determine the AED which best suits your needs. Our most frequently asked questions…answered! 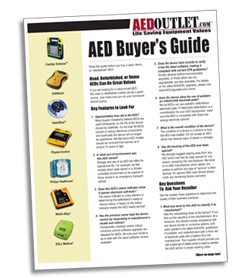 Key considerations, and a short list of options to help you get all you need for an effective AED program. Contact information for the AED Superstore, plus the important promises we keep to assure your complete satisfaction.